Plaza de Toros de Las Ventas, Madrid's Premier Bullring. 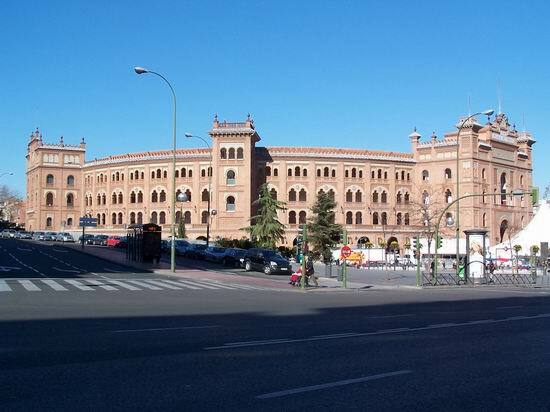 The home of bullfighting in Spain, and arguably in the world as well, is at Plaza Toros Las Ventas in Madrid. The massive bullring can be found in the Guindalera quarter of Madrid's Salamanca district to the northeast of the city centre. The architect who designed it was José Espeliú. He employed a Neo-Mudéjar style, one that was popularised by the Arabic Moors of the 12th century. This gives the structure a more ancient look than it actually is. Construction of the Plaza Toros Las Ventas bullring started on March 19, 1922. It replaced the former main bullring of Madrid built in 1874, located at Carretera de Aragon, and it cost 12 million pesetas, about one third more than originally estimated. Construction was completed in 1929, but the inauguration didn't take place until June 17, 1931. Following the inauguration in 1931, Plaza Toros Las Ventas was effectively closed again until Oct. 21, 1934 when it was officially opened once again. During the Spanish Civil war years between 1936 and 1939 it also remain closed, only opening in May of 1939. The first bull to rush out onto the new bullring floor was one called Hortelano. A bullfighter nicknamed "Aguililla" was the first to face the bull, and the first music to be heard in the arena, played by the Municipal band, was España cañi, the pasadoble. Plaza Toros Las Ventas is the third largest bullring in the world. The largest is the Plaza de Toros México in Mexico City, and the second largest is Plaza de Toros Monumental de Valencia in Venezuela. Plaza Toros Las Ventas is of course the largest bullring in Spain. It can seat 25,000 people and it measures an impressive 60 metres in diameter. The best time to experience bullfighting in Madrid is during the San Isidro fiesta, which takes place between May and June each year. This is the most famous bullfighting festival in the world and fights take place every day for three weeks. The bull fights start at 7pm and generally last some two or three hours. During San Isidro it is difficult to get tickets for the fights as they are so popular, so the best option is to purchase bullfight tickets online. Ticket prices depend on where you are seated. There are differences between seats in "sol" and those in "sombra" - the sun or the shade, with the latter being the more desirable and therefore the more expensive. Tickets for bullfights at Plaza Toros Las Ventas can be purchased at a number of outlets including the Las Ventas bullring ticket offices. They are open from 10am to 2pm and from 5pm to 8pm on the Friday and Saturday before the fight on Sunday. Tickets can also be bought on the Sunday between 10am and 5pm. However, as mentioned above, to be sure of your place in the bullfight arena, the best option is to purchase online here. Metro: Lines 2 and 5.